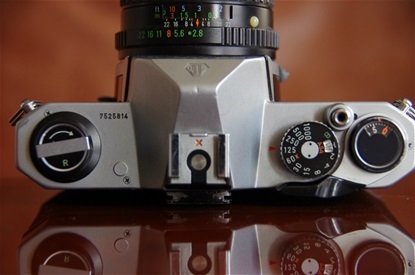 After more than 25 years of use, time had run out for the famous M 42 mount. 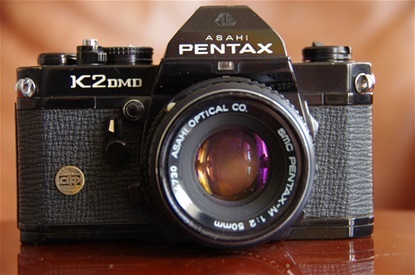 It was invented by the Praktica-constructors in Dresden, East-Germany, in the late 40s and soon adopted by Asahi Pentax. 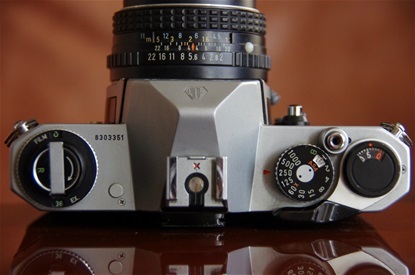 Pentax had such world wide success with it,that it came to be known as the Pentax-mount, though used by several other Japanese brands. But it was slower to use than most bayonet mounts, but most of all it was a challenge to transfer an increasing amount of signals between camera and lens as the automation hit the industry. 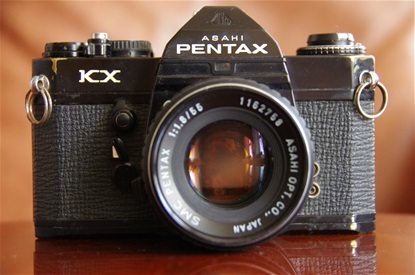 So, in 1975 Pentax released their new system, the K-mount. It was a necessary move, although not always popular amomg the M-42 lens owners.This first K- mount is basically the same as the one being is used on todays DSLRs! From 1975 comes this all manual KX model. It was the big brother of the KM, upgraded with more sensitive meter, wider ASA range and a lock up mirror. 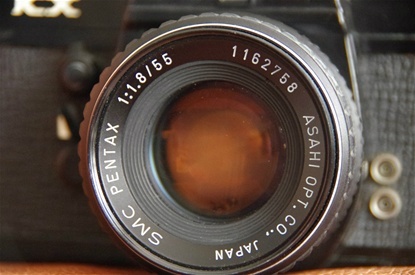 Also note the window under the PENTAX name. It gave light to the f-number to be seen in the finder. Later to be used on the K2 DMD and many later models. Size: 143x91,5x52,5. Weight: 631g. Sn: 8110935. 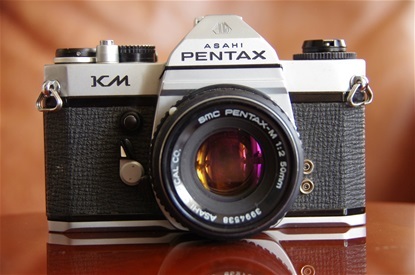 Pentax SMC 55/1,8. Sn 1162758. Release button for ASA setting to the left of the rewind dial and battery check button as on the ES models were the special controls for the KX. Sn: 8110935. 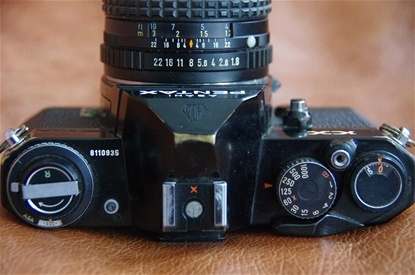 A fully manual camera. 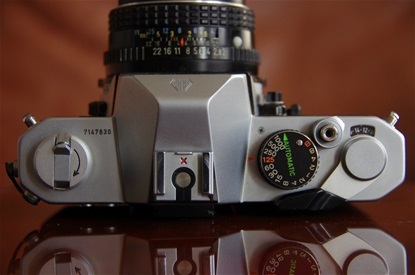 A pre K1000, but with DoF (Depth of Field control) and self timer. Size: 143x91,5x52. Weight: 622 g. Sn: 8303351. K 1000 was a budget model fully manual. It became legendary as it came to be the choice of photo students around the world. First produced in Japan from '76 till '78, then in Hong Kong from '78 till '90 and finally in China till 1997, when the MZ-M was supposed to take over. 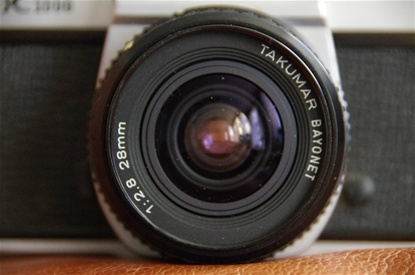 Here is a camera produced in Japan with sn. 7525814. Size:143x91,5x49. Weight: 620g. Pentax renamed their lenses after the introduction of the K-mount. 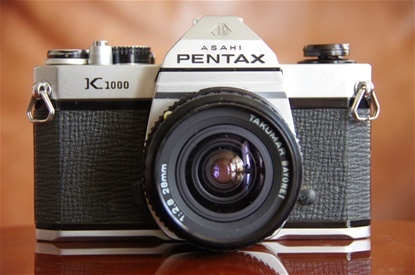 The better lenses got the Pentax name, while the Takumar name was only found on the lenses without super multi coating, and often following the budget models, like the K 1000. Standard layout. The proof for being made in Japan: sn. on top. S/n on bottom plate with a sticker saying "Assembled in Hong Kong"
Special Edition. Mostly, but not always, in brown leatherette. 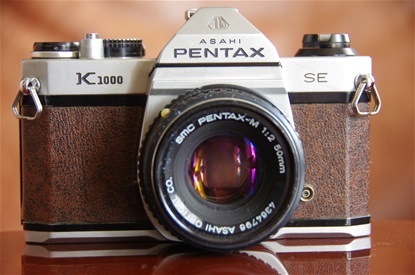 Technically the difference from the regular K 1000 was the Split Image focus system, as opposed to the traditional micro prism. Sn: 6038735. 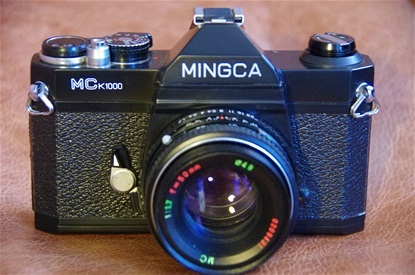 When the production of the K1000 was moved to China, the Ming Camera factory was chosen. Pentax put up their machines there and they did the job from 1990 till 1997. As Pentax was discontinuing this model, they sold all the machines to Ming. And soon after, this model turned up, the Mingca MC K1000. A big seller in China but extremely rare over here. A reader has informed me that other names were used for this camera: Luxor Super 1000, Maginon K 1000, Optium MC K 1000 and Spender FMC-970. 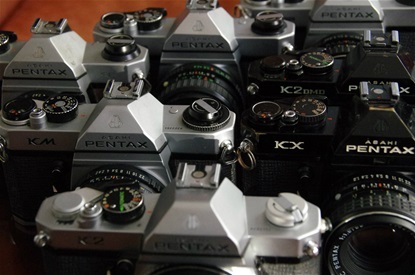 All produced with the former Pentax machinery. The K2 DMD was a K2 with Data back and motor option, but it also featured eight other upgrades from the K2. Namely, exposure memory lock, extended exposure memory, split image focusing aid, enlightened f-number in the finder (inherited from the KX), low battery voltage warning, exposure compensation warning, built-in eyepiece blind and interchangeable back walls. My copy of the DMD has s/n 7172577. Almost identical to the K2. Who finds the small difference? 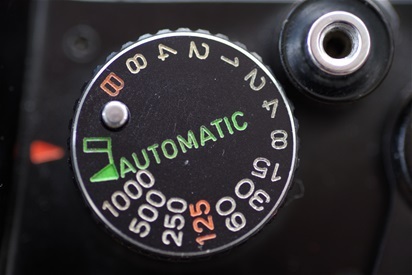 Here it is: A small mark, like a square, beside the AUTOMATIC-arrow, and thus connected to automatic mode. 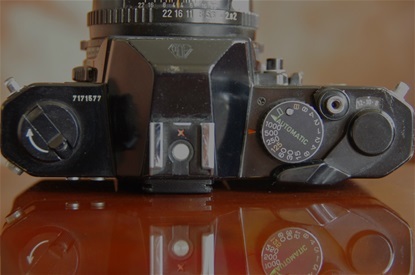 When turning the dial to this position the finder goes black, and no false light will affect the meter. 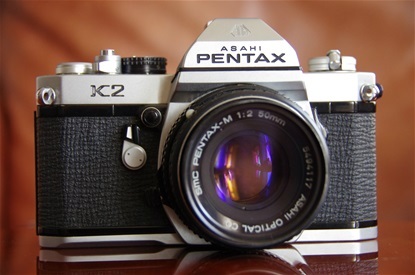 Interesting website, nice to read about the pentax camera history and others. Correct! No lever. 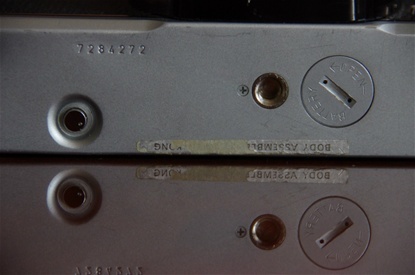 But as it is connected to the automatic shutter, you have to shoot automatic if blinding the finder! Thanks for bringing this up! Hello again, you blind the finder with shutter speed dial. As it calls in http://www.cameramanuals.org/pentax_pdf/pentax_k2_motor_drive.pdf Built-in eyepiece..
Hi again, I have corrected the text with the eight other upgrades. But there was no lever to blind the finder. So, how do you blind it? Answer will follow..
Hi, and thanks! I will look into it and add it to my text. Thank you, Gene! I will look into that. Where did you find the information? Thank you! I do mention the Pearl River brand at the Front Page, but I was not aware of the K 1000 clone. Thanks again!